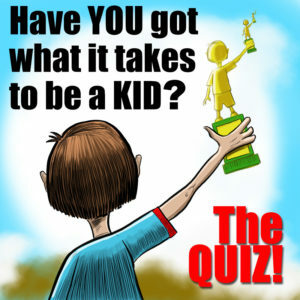 Got What It Takes to Be a Kid? Take the QUIZ and find out! What is the difference between a shirt and a napkin? One is a thing that I wipe my hands on when they're covered in food, and the other is a napkin. I wear one and lay the other across my lap during meals. I cannot think of a difference. If I told you that you could only have one of these cereals, which would you want to eat? I really shouldn't. I'm having brunch with Diane at 10am. If we were at the drug store and I said, "Since you were so good at the market, you can get ONE thing here," what would you like to have? A lightbulb to replace the one that just burned out in the office. I clip the side closest to me first, then the far side which leaves an acute point. I then trim that point followed by the obtuse point left between the close side and the middle and then the obtuse point left between the far side and the middle. I sit on the couch and hold out my hand. What's the best part of Thanksgiving dinner? Do you ever sit in a seat that sits in a seat? In the car, I sit in a car seat that sits in the car's seat. At restaurants, I sit in a booster seat that sits on the booth seat. Very good. I thank you for letting me watch my program. What did you wear on your feet the last time you went outside to play? Socks. Not inside of shoes. Just socks. Right out there in the dirt and the water. Just socks. Again. If I have three rocks—one small, one large, and one medium sized—what can you tell me about them? The small one is the baby. The big one is the daddy. The medium one is either the mommy, a large baby, or a small daddy. I cannot look at your rocks. I am late for traffic school. OK, that was it! The quiz is over! Can I check one more box? Just one more? Please? That was a perfectly acceptable number of questions. Thank you for your time. CONGRATULATIONS! YOU HAVE DEFINITELY GOT WHAT IT TAKES TO BE A KID!! You are full of magic and wonder and sugar and questions and ketchup and probably not enough vegetables. You make weird faces and sounds, and when you see a group of things, like Ninja Turtles, you pick which one you are. You're really, really good at something, even if you don't know what it is yet. Also... piñatas, right?! Now it's time to say "thanks" to the person who let you have screen time and GO OUTSIDE TO PLAY! There's a ton of sand out there just waiting to fill your shoes and be dumped out onto a nice living room floor! CONGRATULATIONS! You've got what it takes to be... A MIX OF THINGS! You are a very interesting person. You're one of those people who wear roller skates while surfing. You love the playground, but you don't go on the monkey bars because they're too hard to do while drinking coffee. At home, you watch "Nature Cat" and spend all night reading books on how to read faster. Your friends are HUGE to you because you're only three inches tall. Also, the bank that you work at has a parking space reserved for your Go-kart. Everybody who is like you is one of a kind! CONGRATULATIONS! You've got what it takes to be... AN ADULT! According to your answers, you may be the oldest person on the Earth. So thank you for taking a break from sleeping, drinking protein shakes, using big words, and trimming your eyebrows for long enough to take this quiz! I hope you enjoyed it as much as you enjoy long books with no pictures. Sleep well this afternoon and please tell your great, great, great grandchildren that they can hear some fun music by clicking the "MUSIC" tab above! A few days ago, I was messing around with my hands in the mirror (as grown adults do), and this little dude just crawled out. How could I not let him sing this? !